Earlier this month, Source One debuted its insight report detailing the results of Marketing and Procurement collaboration. The report, which illustrates in clear detail the numerous benefits of involving Procurement in a traditionally off-limits category like Marketing, has proven to be a hot commodity among and popular download for Procurement and Strategic Sourcing professionals, thanks in part to the positive reviews from organizations like ThomasNet. 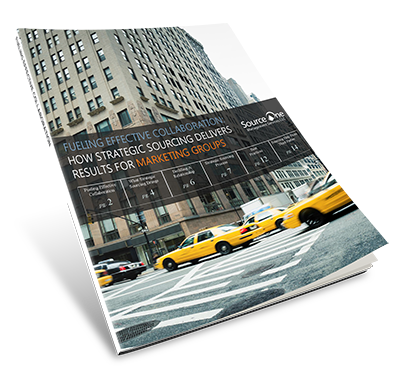 Get your free copy of the Marketing Insights Report today at marketing.sourceoneinc.com. Source One VP of Professional Services Joe Payne, who just recently penned a two-part series on supply chain's failure to implement strategic initiatives for Sourcing Innovation, will be attending NCSU's Supply Chain Resource Cooperative next week on April 23 and 24th. The topic of the event will be Managing Relationships to Drive Supplier-Led Innovation, which coincides with the rise in importance for Supplier Relationship Management initiatives in best-in-class sourcing groups. Source One VP of Operations William Dorn will be attending the Corporate United Supplier Summit in Chicago on May 12th and 13th. The event, hosted by Corporate United - the nation's largest Group Purchasing Organization - will serve as a networking event. Events such as these are also one of the many ways Source One stays on top of current and future industry trends and best practices, so that we can offer our clients unparalleled insight into the industry and optimization of their own internal practices.